It. Has. RETURNED. 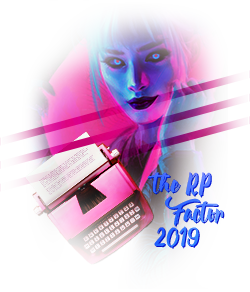 The RP Factor, last held in the summer of 2016 and featuring fifteen talented contestants, is back with a post-apocalyptic vengeance, filled with countless fantastical and, of course, lethal prompts designed to put even the most skilled writers to the test. We seek master wordsmiths for this endeavor, though you will need more than a strong command of syntax to rise to the top. You see, a role-player's skill lies not only in his ability to manipulate the written word to charm and beguile readers, but also in his prowess to build worlds so spectacular that you can feel the foreign air on your skin and sculpt characters so intriguing and real it seems as if you've known them for your entire life. As if crafting beautiful, innovative stories wasn't enough, our contestants will also have to work alongside the very foes they hope to slay! A good writer can produce compelling stories on their own, but only a truly great writer can weave together the ideas of many into one cohesive masterpiece. So, what say you? We know we are asking for a lot, but what sort of competition would this be if we were not demanding only the very best? If you think you are worthy of this challenge, then proceed to the below sections. This time around, twenty (20) brilliant role-players will be chosen to compete in this infamous showdown. Once chosen, these contestants will write their way to the top, all while working with at least one partner. There will be eliminations, prizes, and copious amounts of blood, sweat, and tears. Seriously, A Game of Thrones has nothing on the trials our esteemed competitors will endure! As with every major competition, all twenty contestants will begin in Round 1, but only three master role-players will advance to the finale in Round 6. Each round will present a challenge to which the contestants must respond to the best of their abilities. While the writing prompts and particular tasks will vary, the theme of this year's competition is loosely post-Earth worlds, though not all rounds will necessarily cater to this theme. To further spice things up, the organizers will also provide each group with a twist as their role-play progresses; contestants will be expected to respond to this twist or face certain doom. After each round, a set number of contestants will be eliminated, while the rest will proceed to the subsequent round. Contestants will have ten days to plan and write out their role-plays, after which time the judges will take three days to assess and score the entries. The contestants will be anonymous. For as long as they remain in the competition, the contestants will use a contestant account, provided by the RP Factor organizers, to compete. Every post pertaining to the RP Factor competition - be it in planning, in making a roleplay post, or in posting a question to the organizers, among other things - must be made using the allotted contestant account. If a contestant reveals his/her identity at any time to anyone on- or off-HEX, he/she will be disqualified and immediately removed from the competition. A set of rules regarding contestant accounts will be forwarded to successful applicants. An esteemed panel of trusted judges will evaluate all applications for the competition and will continue to score the contestants during each round with the exception of the final round (Round 6), which will be solely based on audience voting. The audience will also be able to vote in every round excepting applications and Round 1, so do not fear if you wish only to spectate! Don't feel like you're up to writing, but would still like to be part of the RP Factor? Head on over to our Audience Participation thread and support both the competition and the contestants by donning an avvie and casting votes for your favorite writers (beginning Round 2). We will also be posting a participation task for the audience at the beginning of every round. If altruism isn't reason enough to jump right in, there are wonderful prizes, tons of Galleons, and some House points up for grabs as participation incentives. We have not forgotten about you, so come show us some love! Now, after making it this far, it is time for you to decide if you want to throw your quill into the arena. If you are interested in applying for a spot in the competition, then please make your way to the following post, where the application form awaits. If you have any questions or concerns, please feel free to post them in the discussion thread, or owl one of the judges: Lucas, Zoe, Katie, Sarah, Hallie, Erin, and Cody. To apply for the RP Factor 2019, complete the following form and owl it to Beedle the Bard, BBCode checked off by February 14th, 11:59 PM HEX time. If you fail to submit an application with BBCode checked off, then the judges will review your submission without the proper coding. Late applications will not be entertained. Please don't be a dead end! I will legit sell my soul and become a chaste little ardent who doesn't have naughty thoughts about the male anatomy AT ALL if around that corner is a meadow with fresh flowers and sunshine and... Kai abruptly threw herself into a barrel roll as she rounded the next bend; a ball of molten, emerald flames passed mere inches above her scalp, its residual heat leaving a series of uncomfortable kisses against her ebony skin. She dug her hands into the sandy pathway, the coarse, crimson grains wedging between her fingers, and pushed herself to her feet. "So much for meadows! I guess my perverse mind is too inundated with chiseled abdominals for the Almighty to covet," she muttered drily. Kai continued down the narrow corridor, raking her violet eyes over every inch of the steel walls that towered above her. Must be a maze of some sort. Or, worse yet, an arena. Throughout her time in the makeshift prison - what had amounted to hundreds of intersections and myriad hours - she had encountered a few other individuals, all possessing unique... abilities. Which would have been lovely, if the maze hadn't proven more bloodthirsty than a lover scorned, unfailingly producing dangers and obstacles that only one individual could overcome. As a result, the majority of her encounters hadn't been exactly amicable. "Let's see..." Kai mused aloud as she inched down the seemingly innocuous walkway, her tan jumpsuit rustling slightly with the movement. "There was the man with the orange horn who could shapeshift into a bull, the woman with tattoos that literally flew off of her skin and formed lethal projectiles... it's almost enough to make the Lore seem true. Almost..." She shook her head to dispel the thought, her spiky, indigo hair wavering slightly. It was hard enough for Kai to concede that multiple magical realms might exist, let alone that there might be someone out there who could Summon individuals from each. The lithe young woman made her way forward, determined to outpace her errant speculations. Up ahead, she could see the sand giving way to a pit of liquid that gleamed dully in the fluorescent lights that illuminated the space from some unseen vantage point. She neared the pool's edge and stared down at its perfectly smooth surface. Though there were no instructions, the obstacle was clear enough: swim across. "I know I asked for a meadow, but there is no way in Damnation that I'm getting in that. Who knows what little nasties are just waiting to slither up my jumpsuit. NOPE." Suppressing a shudder, Kai snaked a hand into her jumpsuit pocket and retrieved a roughly-hewn, baby blue stone that seemed to contain a vaporous, swirling light. Fortunately for her, she also possessed a few tricks of her own. Mouth widening into a feral grin, Kai inhaled. The light flowed from within the stone into her open mouth; it was as if someone had suddenly set her blood on fire. Foreign energy coursed through her veins, causing time to slow and her heart to beat frantically against her ribcage. Picturing the desired effect in her mind, she outstretched a hand toward the water; light leapt from her fingertips and streaked across the pool, leaving a delicate, icy bridge in its wake. "That'll do quite nicely. So sorry to skip today's communal swim of death - maybe next time!" Stormlight still humming in her system, she made her way across the ice, which ended mere feet before the next intersection. Kai rolled her shoulders backwards and allowed herself a brief exhalation. Out of one frying pan and into the next inferno. Let's go. She took a step forward... and promptly halted as her pointed ears registered a familiar sound: talking. Though she couldn't make out any details about the speaker from this distance - the walls seemed to absorb sound, rather than reflect it - there was undoubtedly at least one other person around the next bend. Kai forced her mind to become cool, clinical, detached. As still as the pool behind her. She slid a hand into her pocket and fingered the collection of gemstones, one for each primordial element, distinguished by color. As if of their own accord, her digits sought out the smooth, triangular stone that she knew without looking was pitch black. Shadows. Right, then. Might as well get this over with. Forcing her face into a small smile and forcing her small frame to curve inward on itself, Kai stepped around the corner. Note: You should respond from the perspective of an original character of your making. "Dancin's not a crime 'less you do it without me." It has begun. Round One of the RP Factor 2019 can be found here. Head on over before you miss any action-packed writing! If you haven't already, also be sure to check out our Audience Participation activities. There are a lot of amazing prizes up for grabs! Round one results are in! Head on over here to see which splendid writers will be battling it out in Round 2! Round 2 is now over. Read the entries here, and be sure to vote for your favorite contestant here! Round 2 results are in! Head on over here to see which splendid writers will be battling it out in Round 3! Hey, lovely users! We need YOUR input for a future round. Want to decide what prompt our talented writers have to fulfill? Then come here and leave us some suggestions! We'll be using the winner's prompt in round 5! Also, if you could, be sure to include some appropriate/creative quotes that we could use to accompany your suggestion in our writeup! Note: non-eliminated contestants are NOT eligible to submit ideas. Round 3 is now over. Read the entries here, and be sure to vote for your favorite contestant here! Don’t forget to send your votes for Round 3! Voting closes March 26th at 16:00 HEX time! Only a few more hours to get your votes in for Round 3! Voting closes March 26th at 16:00 HEX time! Your favorite writers could be depending on your support! Round 3 results are in! Head on over here to see which formidable writers have survived to write again in Round 4! Due to the April Fool's Day prank, the deadline for Round 4 has been extended to tonight, April 5th, at 11:59pm HEX time. Be sure to keep up with the wonderful RPs our contestants are weaving! Round 4 is now over. Read the entries here, and be sure to vote for your favorite contestant here! Voting will close tomorrow at 4:00PM HEX time, so come help your favorites stay in the competition! Don't forget to get those Round 4 votes in! Read the entries here, and be sure to vote for your favorite contestant here! Voting will close today at 4:00PM HEX time, so come help your favorites stay in the competition! Round 4 results are in! Head on over here to see which formidable writers have survived to write again in Round 5! Round 5 is now over. Read the entries here, and be sure to vote for your favorite contestant here! Voting will close tomorrow at 6:00PM HEX time, so come help your favorites stay in the competition! Don't forget to get those Round 5 votes in before 6:00PM HEX tomorrow! You can read the entries here, and cast your votes here! Time is running out to cast your votes and help determine who will make it to the top THREE of Roleplay Factor! You have until 6:00PM HEX this evening to help decide our lovely writers' fates! You can read the entries here, and cast your votes here! Last call for user voting! You have until 6:00PM HEX this evening to help decide our lovely writers' fates! You can read the entries here, and cast your votes here!